In the sweet varieties, we have viLampazham, MAngAi (aRuchuvai pachchaDi), Sweet Tomato and Fruit pachchaDis. Let us see how we prepare these. The fruit should be ripened. It should be brown in colour without any greenish tinge and when you shake, the inside content must move. It will be lighter than the unripened one. Another test is to drop from a height of about one foot when it should remain where it was dropped instead of moving further. Remove the shell and take out the pulp. Mix with the jaggery and salt well and allow it to settle for 10 minutes. Again mix well and season with mustard and red chilli pieces. 1. MAngAi pachchaDi (green mango) pachchaDi is made by washing and cutting the mango into medium sized pieces. The seed is also used if you like. These are boiled in water with ¼ tsp of salt and ¼ tsp of turmeric powder for 10 minutes. Then we add jaggery shreds to taste and boil for another 10 minutes. 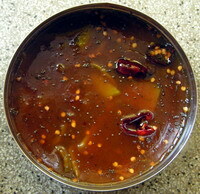 When the mixture thickens, season it with red chilli pieces, mustard seeds and dried neem (margosa) flowers. This is also called “aRusuvai pachchaDi” since it has all the six tastes: sweet, bitter, salty, astringent, sour and spicy hot tastes. It is normally prepared on the Tamil New Year day signifying the life that has different tastes. It is also prepared on PonDugaL (Sumangali PrArtanai) day without neem flowers. 2. Sweet tomato pachchaDi is prepared in the same way. Cut tomatoes into medium pieces. Take oil in a kaDAi and add mustard seeds and red chilli pieces. After the mustard splutters, add the cut tomato pieces. Close it with lid and let it sauté for 3 minutes. Then turn them and sauté for another 5 minutes till the water dries. Add jaggery shreds, a little salt and mix well till the contents are of thick syrup consistency. Some people add sugar and ginger shreds. Bengalis add Kalajeera instead of mustard in some cases as well as pieces of dates. Some use green chilli too. 3. Fruit pachchaDi is served during marriages or other big festivities. This is also made as above. Here we take apple, banana, grapes and a little tomato. Cut them into small pieces. All these make 1 cup mixed fruits. We also cut cherry fruits into small pieces. Now take ½ cup of sugar and heat with same quantity of water for 10 minutes to get syrup. Add the cut fruits with cherry pieces and boil for 5 minutes. When the fruits mix well with the syrup, remove from fire. After it is cooled down we add rose or vanilla essence and red food colour a little. Some people add pineapple essence. If oranges are available we can include them to enrich the taste. Adding essence and colour is optional. 4. In the salty variety, when you make tomato pachchaDi, some people do not sauté the pieces but use them raw adding a little coconut shreds and chopped coriander. Some add these after sautéing. All these depend on creativity and innovation without spoiling the taste. 5. I also make another pachchaDi which is called “Baingan BarIth”. Here I take out the pulp of Brinjal after heating it over fire, smearing oil as done in the case of Baingan BurtA. I mash the pulp and mix it with curd, green chilli pieces and salt. Finally season it with mustard and chopped coriander leaves. This goes well with Vatral Kuzhambu. 6. The curd for pachchaDi must be thick and should not be very sour but slightly sour in taste. This entry was posted on May 13, 2011 at 10:34 pm and is filed under PachchaDi Varieties with tags aRuchuvai pachchaDi, baingan bareeth, fruits, grated coconut, green chilli, jiggery, mangai, mango, mustard seeds, red cherry, red chili, salt, sugar, tomato, turmeric powder, ViLampazham. You can follow any responses to this entry through the RSS 2.0 feed. Both comments and pings are currently closed.